Successfully Added Focus Mini Slider Cellphone (Quadband, Dual SIM, Unlocked) to your Shopping Cart. The unlocked Focus Mini Slider Mobile Phone with quad band world calling functionality and two SIM card slots. One of the most popular Chinese cellphones on the market today because you get so much for so little. You'll love The Focus Mini Slider Cellphone for two very good reasons. It's small in both size and price. This amazingly compact cellphone measures only and weighs just ounces. Holding it in your hand it provides the feeling of comfort and assuredness that other bigger, clumsy phones cannot. What's more it's the finest under 60 dollar slider cellphone you'll find today! Yes that's correct - less than 60 dollars for a worldclass GSM world phone that accepts two SIM cards! It's big on both performance and style. 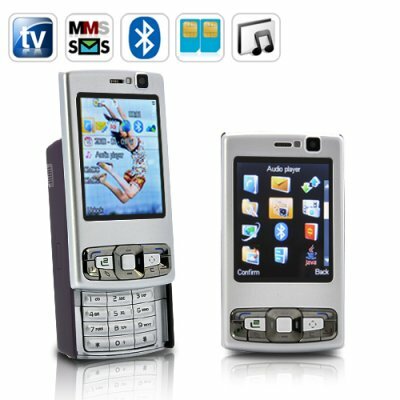 The Focus Mini Slider Cellphone is also a great little digital camera, video camcorder, MP4 and MP3 player. Slide the phone one way to reveal its keypad. Slide the phone the other way to reveal the media player buttons. With this one little phone, you can get rid of all the other clunky gadgets that weigh down your pockets or purse...imagine the feeling of freedom you'll experience with one small device which serves all your personal and business needs! Get your Focus Mini Cellphone with quadband GSM (850, 900, 1800, and 1900MHZ) and dual sim card slots today. For yourself, for someone you care about, or to resell on your online store. Brought to you by the leader in Chinese cellphones - Chinavasion. One of the hottest China cellphones on the market today! Dual directional slider. Slide one way it reveals the keypad. Slide the other way to access the media player. Best under 60 USD quad band, dual SIM cellphone on the market today!